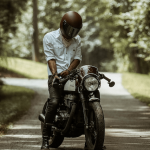 With 43mm front forks; 9.8:1 compression ratio; new style exhaust headers; new camshaft; now with oil-cooled pistons and forged rods, this is one beautiful motorcycle. But when will we see hydraulic lifters? 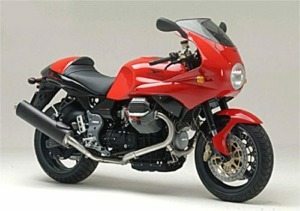 This description of the Moto Guzzi LeMans is a translation from the Moto Guzzi site: “There are two essential elements for a sporty, safe motorcycle: a powerful engine and a rider capable of getting the best from it. Performance in itself is not enough, manageability is a decisive element. Moto Guzzi technicians have worked in both directions, improving propulsion characteristics and two wheeler qualities of the V11 Le Mans motorcycle. The 90° V-twin engine not only represents a distinctive chapter in the entire history of the two-wheelers, but it is a unit which – through the years – has progressively attained higher and higher standards in performance and reliability. The V11 Le Mans 2002 adopt the latest version, with a 1.064cc cubic capacity and two top valves, controlled by cocker arms and push rods. The engine performance has been increased, at medium rpm’s, thanks to an increase in the compression ratio – which moves from 9.5 to 9.8 to 1, and at low RPM, thanks to a change made in the exhaust manifold. The 2002 model, is fitted with a new connecting “cross member” between the manifolds of the twin cylinders that allows a better balance between the thermal parts, and a better power supply, increased by several horsepower, above all, at medium rpm’s, where the bike has to give its best. Another important plus for the 2002 version is given by the new oil jet system that has been designed for cooling the piston, after having designed a new forged connecting rod, which decidedly improves performance levels in difficult conditions and give the component a much longer lifespan. The exhaust presents another new idea: the canister silencer has undergone unprecedented treatment, guaranteeing greater resistance to wear and tear and it therefore lasts longer. Fuel pump working has also been improved, and this is now immersed in the tank. In keeping with the goal of being lightweight and agile, the standard gearbox was redesigned and turned into a structural component to keep the wheelbase to 56” (1423 mm) maximum. With the short wheelbase, perfect weight distribution between both wheels and weighting in at less than 423 lbs (192 kg), the MGS-01’s overall stunning aerodynamic design ensures perfect agility and performance on and off the race track.